Goal: Sustain Our Nation’s Forests and Grasslands Why are we using prescribed fire in upland hardwoods? Prescribed fire in upland hardwoods can be a management conundrum. Challenges include timing fire to meet goals for forest reproduction without introducing damage to the residual stand. Scenarios are presented to help managers better understand these challenges. Research foresters Dan Dey from the Northern Research Station and Callie Schweitzer from the Southern Research Station have been addressing the use of prescribed fire in upland hardwood systems in studies and symposia for years. They recently worked to capture their experiences and insights in ‘A review of the dynamics of prescribed fire, tree mortality, and injury in managing oak natural communities to minimize economic loss in North America’ published in the journal Forests. Prior to publication, Schweitzer solicited review comments from the Tennessee Department of Agriculture, Forestry Division staff, who had encouraged this work and publication. 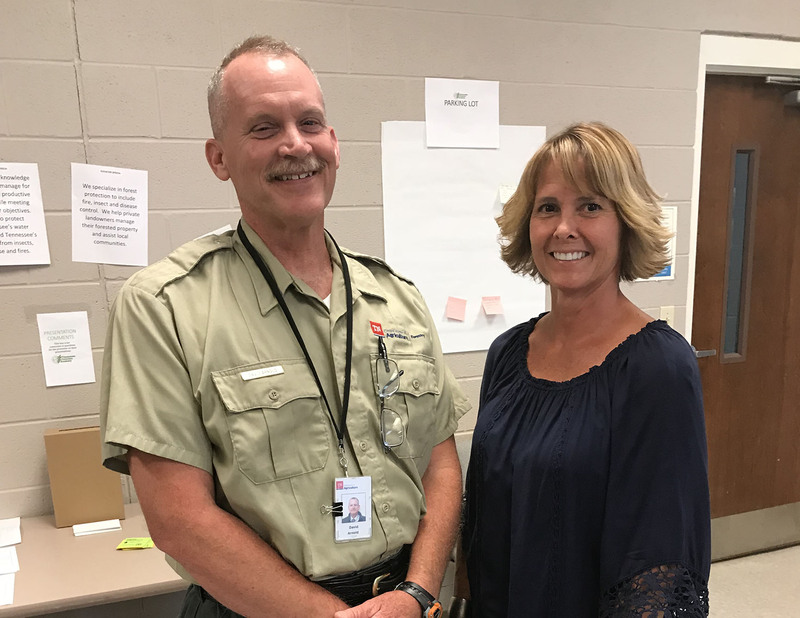 The newly appointed Tennessee State Forester, David Arnold, asked to use the publication as a template for the 5th annual ‘Saws and Claws’ event, a collaborative gathering of Tennessee’s forestry (saws) and wildlife (claws) resource professionals, held in Knoxville in July. Division staff reviewed the paper with the group and led a lively discussion, with Schweitzer present to support and enhance salient points. On the second day the group toured sites on Tennessee’s Chuck Swan State Forest that highlighted the various scenarios depicted in the paper. A better understanding of the management intentions and the role of prescribed fire was achieved.